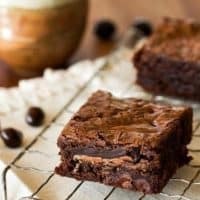 Easy Mocha Brownies- Rich chocolate brownies are loaded with chocolate covered espresso beans and mocha squares to create a decadent dessert perfect for any chocolate lover. Last week I received an email from a reader (Hi Kelly!) asking if I had a favorite brownie mix. I responded to her email immediately listing my fave followed by a gazillion exclamation points because, let’s face it, brownies excite me. 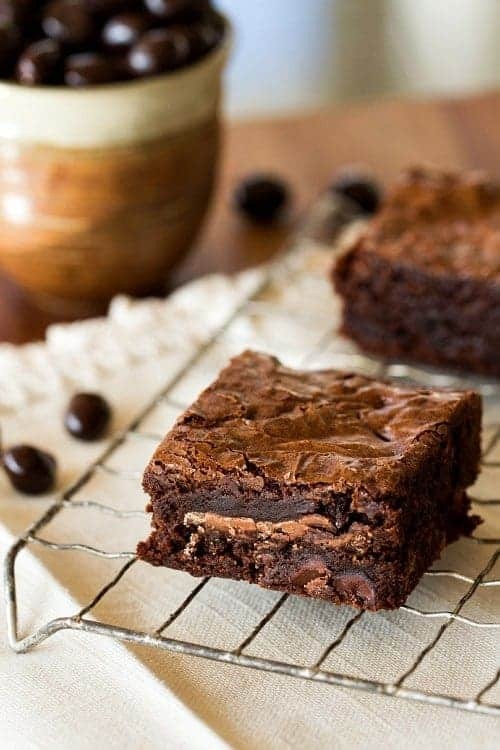 Really, I don’t think I’ve met a brownie that I didn’t like unless we’re counting the super dry ones with a layer of powdered sugar that graced my junior high lunch trays. Those? They were nasty. Not only do I love brownies, I love stuffing them with candy to create recipes like Twix Brownies and Salted Caramel Brownies. Because what better way to make brownies better than with more chocolate? If you’ve followed My Baking Addiction for any length of time, you know that I’m a fan of using cake mixes every now and then. 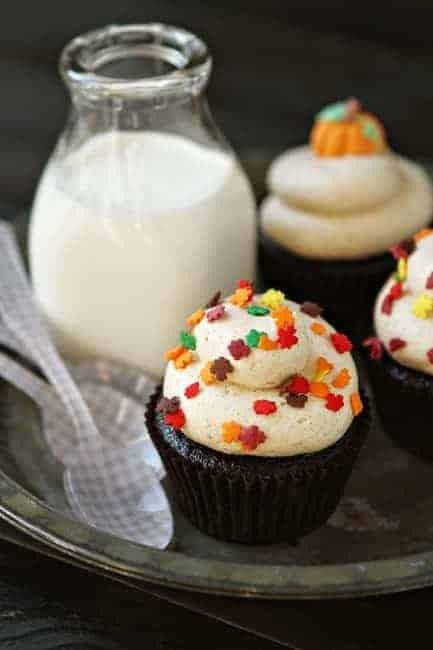 In fact, one of my fave cupcake recipes is a Doctored Up Cake Mix. And although I’ve never posted a recipe for a jazzed up brownie mix brownies, I thought I totally should. The boxed brownie question was pretty easy to answer because I definitely have a favorite – hands down Ghirardelli. They’re the richest, fudgiest, chocolatiest brownies ever. And since we’re all friends here, I’ll go ahead and confess that I kinda prefer them to homemade, so I always have a few boxes on hand for those late night chocolate cravings. Kelly and I emailed back and forth a few times and she mentioned that she’d love to see some brownie mix recipes pop up here on MBA. How could I deny her? While perusing the candy aisle at Target (strictly for research purposes) I happily stumbled upon a bag of Ghirardelli Mocha Squares and they leaped off the shelf and landed directly into my cart. Can you tell I have a thing for Ghirardelli? The idea for Easy Mocha Brownies was born. I started out with Ghirardelli’s Double Chocolate Brownie mix and added in instant espresso granules, chopped chocolate covered espresso beans and a layer of Ghirardelli Mocha Squares. Seriously, these are a mocha lover’s dream come true. And if you let them cool for about an hour, the brownies will set up, but there will be a glorious band of melty Mocha Chocolate throughout the center. It’ll be hard to wait that hour, I have to tell you. The glorious smell that is coffee and chocolate together wafting through your house may just be too much temptation. You might have to leave for a little while. But it is SO worth it! You want brownies that won’t fall apart, it’s a sacrifice you have to make. This is the sort of recipe that comes in handy when you’ve got guests coming over out of the blue, or a late night craving for chocolate that just won’t quit. If you don’t care for box mixes, cool! Try some of my homemade brownie recipes instead and create from scratch mocha brownies! Brownies are worth smiling about, no matter where they come from. Except that school lunch tray. Preheat oven to 325°F. Line an 8x8 inch baking pan with foil; allowing a little to hang over the sides. Spray the foil with nonstick cooking spray. Place Ghirardelli Double Chocolate Brownie Mix into a medium bowl. Stir together the water and instant espresso powder and add it to the brownie mix. Stir in vegetable oil, egg and vanilla. Fold in crushed chocolate covered espresso beans. Spoon half of the batter into the prepared pan. Evenly place the Ghirardelli Mocha Squares over the batter and top with remaining batter, spreading it into an even layer over the Ghirardelli Squares. Bake mocha brownies in preheated over for 40-43 minutes. Cool completely before cutting. 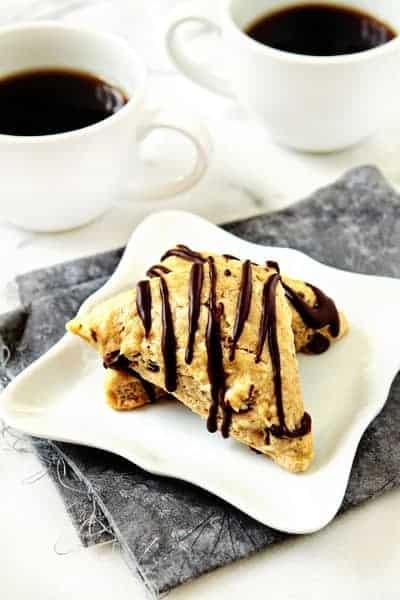 Looking for more mocha recipes? Check these out! You’re totally right; Ghirardelli definitely rocks the brownie world. I especially love baking a double batch of them in a 9×13 pan– super thick and fudgy! These look absolutely fabulous! 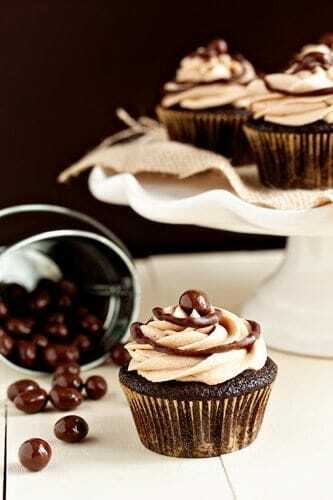 Coffee+ chocolate= heavenly!! Thanks so much for stopping by, Danielle! Chocolate + coffee is always a WIN for me! These look so decadent and delicious Jamie! Me too, Liz! Thanks so much for stopping by! These are pretty genius! And I agree, there’s something about homemade brownies that doesn’t quite feel right sometimes – probably just because I grew up on the boxed mixes! Can’t wait to try this recipe. When my great grandmother, who lived until 103, no longer felt like making things from scratch she taught me the following trick. She told me if you scratch the box before you open it, then you never lie when you say it was baked from scratch. And that’s my favorite brownie mix by far. Brownies are one of the few things I make by just scratching the box. That is the best story, thanks for stopping by and sharing. Where can i find the chocolates covered espresso beans? Looks delicious, I would love to try this recipe. I picked mine up at Trader Joes. I hope this helps. Oh my; I’m loving the addition of the chocolate covered espresso beans AND the espresso powder to the brownies! A definite must-make here… Can’t wait for the aroma of coffee and Ghirardelli chocolate! Hi! Got a question: what if we make the espesso? How many shots should we make? I have an espresso machine but no granules. :) Thanks. Great question, Julie. I think I’d use a shot! I hope you enjoy these as much as we did! I agree that this Ghiradelli is one of the best box-mix brownies. My favorite is a William Sonoma mix but it basically costs 3 times as much so seems a bit of a splurge! Love how you doctored them up in this recipe. Thanks so much Lauren. I appreciate you stopping by. Just wanted to say thank you for your website . I get so many good ideas and recipes from you. Love Ghiradelli anything and the brownie mix makes it so eady to be creative. Will have to visit target today. Thanks for visiting Paula. I hope you get the chance to try these. 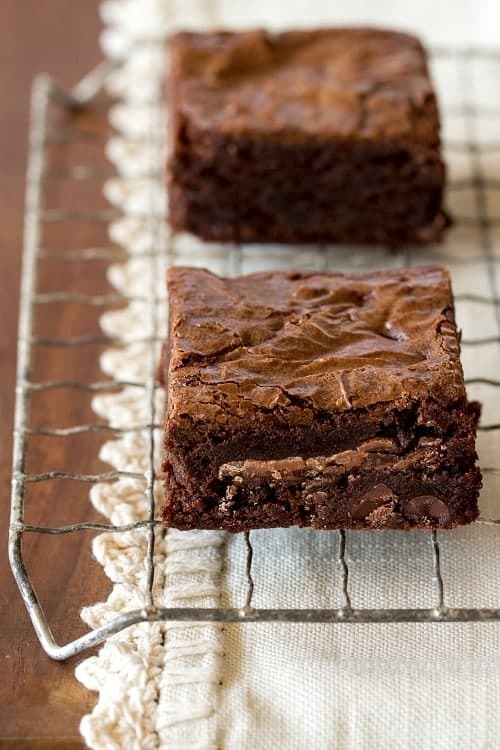 Perfect looking crinkly topped brownie! These are complete perfection!! Especially for a coffee-aholic like me! Add coffee to anything and it automatically has my heart! I love the fact that your recipe uses a mix…this makes it so much easier than having to measure out every ingredient and make them from scratch! Lets be honest sometimes there just isn’t enough time! This is a perfect combination! I think I’ll try them with an dark chocolate brownie mix! !